Grus constellation lies in the southern sky. Its name means “the crane” in Latin. The stars of Grus were once part of the constellation Piscis Austrinus. It was the Dutch astronomer Petrus Plancius who created the constellation Grus from the observations of the Dutch navigators Pieter Dirkszoon Keyser and Frederick de Houtman in the late 16th century. The constellation first appeared in a celestial atlas in 1603, in Johann Bayer’s Uranometria. In the early 17th century, it briefly went by an alternative name, Phoenicopterus, which means “the flamingo” in Latin. Grus is the 45th constellation in size, occupying an area of 366 square degrees in the sky. It is located in the fourth quadrant of the southern hemisphere (SQ4) and can be seen at latitudes between +34° and -90°. The neighboring constellations are Indus, Microscopium, Piscis Austrinus, Phoenix, Sculptor and Tucana. Grus contains three stars brighter than magnitude 3.00 and one star located within 10 parsecs (32.6 light years) of Earth. The brightest star in the constellation is Alnair, Alpha Gruis, with an apparent magnitude of 1.74. The nearest star is Gliese 832 (spectral class M2V), located at a distance of only 16.15 light years from Earth. Gliese 832 is also one of the six stars in Grus with known exoplanets. The others are HD 208487 (spectral class G2V), WASP-52 (G5IV), HD 213240 (G4IV), HD 215456 (G0.5V), and Tau-1 Gruis (G0IV). Gliese 832, HD 215456 and HD 208487 have two known planets each, while the other three stars have one orbiting planet. Grus belongs to the Johann Bayer family of constellations, along with Apus, Chamaeleon, Dorado, Hydrus, Indus, Musca, Pavo, Phoenix, Tucana and Volans. Grus does not contain any Messier objects. There are no meteor showers associated with the constellation. There are no myths associated with the constellation. Grus was one of the 12 constellations created by Dutch explorers in the late 16th century. The only connection the crane has with mythology lies in the fact that it was a sacred bird to the god Hermes. The constellation was created from stars located to the south of the constellation Piscis Austrinus. The brightest star in Grus is called Alnair, which means “the bright one from the fish’s tail” in Arabic. Similarly, the proper name of Gamma Gruis, Al Dhanab, also means “the tail” in Arabic. Alnair is the brightest star in the constellation. It has an apparent magnitude of 1.74 and is approximately 101 light years distant from the solar system. Alpha Gruis is either a main sequence star with the stellar classification of B6 V or a B7 IV class subgiant. It has a radius 3.4 times that of the Sun, four times the solar mass, and is about 263 times more luminous. The star’s estimated age is 100 million years. Alnair is a rapid rotator, with a projected rotational velocity of 215 km/s. Based on the excess infrared emission, the star is believed to have a dust disk in its orbit. The name Alnair comes from the Arabic al-nayyir, which means “the bright one,” from the phrase al-Nayyir min Dhanab al-ḥūt, or “the bright (star) belongs to the tail of the (Southern) Fish (constellation).” The Southern Fish is the English name for the constellation Piscis Austrinus. Beta Gruis is a red giant belonging to the spectral class M5 III. It has a visual magnitude of 2.146 and is 177 light years distant from the Sun. It is the second brightest star in Grus. The star is classified as a semi-regular variable as its luminosity varies in magnitude by about 0.4 over a period of 37 days or longer. Beta Gruis is one of the stars that used to form the tail of the Southern Fish, and before it became part of the Grus constellation, it was the rear star in the tail of the constellation Piscis Austrinus. The star has 2.4 times the Sun’s mass and 180 times the solar radius. It is approximately 1,500 times more luminous than the Sun. Gamma Gruis is the third brightest star in Grus. It is a giant with the stellar classification B8 III, about 390 times more luminous than the Sun. It rotates pretty rapidly, with a projected rotational velocity of 57 km/s. The star’s name means “the tail” in Arabic, referring to its previous position in the constellation Piscis Austrinus. Gamma Gruis has an apparent magnitude of 3.003 and is approximately 211 light years distant. Delta Gruis is a binary star in Grus. It is composed of a G7III-type star with an apparent magnitude of 3.97 and an M4.5IIIa class star with a magnitude of 4.17. Under good conditions, both stars are visible to the naked eye. Tau-1 Gruis is a yellow dwarf of the spectral type G0V. It has a visual magnitude of 6.03 and is 108.58 light years distant from the solar system. An extrasolar planet at least 1.23 the mass of Jupiter was discovered in the star’s orbit in 2002. Tau-1 Gruis has 1.25 solar masses and is 3.6 times more luminous than the Sun. Gliese 832 is a red dwarf star with the stellar classification M2V, lying at a distance of only 16.16 light years from the Sun. The star has an apparent magnitude of 8.66 and an absolute magnitude of 10.19. It is about 9.5 billion years old and has about half the radius and mass of the Sun. The star’s estimated rotation period is 46 days. Gliese 832 is notable for being the closest star to Earth in Grus constellation and for hosting two known exoplanets. A Jupiter-like planet, Gliese 832 b, was discovered in the star’s orbit in 2008 and, in 2014, another planet was detected orbiting at or very close to the right distance to its parent star to allow water to exist on its surface. Designated Gliese 832 c, it was the closest potentially habitable Earth-mass-range exoplanet to the Sun at the time of discovery. NGC 7424 is a barred spiral galaxy with an apparent magnitude of 11.0. It is approximately 37.5 million light years distant. The galaxy is about 100,000 light years in diameter and has well defined spiral arms, so it is called a “grand design” galaxy. So far, two ultraluminous X-ray sources and one supernova have been observed in NGC 7424. The supernova SN 2001ig was classified as a Type IIb supernova, one that initially shows a weak hydrogen line in its spectrum, like typical Type II supernovas, but later the H emission becomes undetectable and is replaced by lines of oxygen, magnesium and calcium and there is a second peak in the light curve. Subsequently the supernova’s spectrum resembles a Type Ib supernova. The supernova was discovered on the outer edge of the galaxy in 2001 by the Australian amateur astronomer Robert Evans. In 2002, Cambridge physicists discovered a binary companion to SN 2001ig, a massive star of the spectral type O or B with an eccentric orbit around the supernova progenitor star, which was believed to have been a Wolf Rayet star. NGC 7424 is suspected to be a field galaxy, which is to say, while it is listed as a member of the IC 1459 Grus Group of galaxies, it is not gravitationally bound to any galaxy group. NGC 7213 is a face-on, type 1.5 Seyfert galaxy in the constellation Grus. The galaxy lies about 16′ to the southeast of the bright star Alpha Gruis. It is one of the brightest spiral galaxies in Grus, with a visual magnitude of 10.1. NGC 7213, image obtained from the Multimission Archive at the Space Telescope Science Institute (MAST). STScI is operated by the Association of Universities for Research in Astronomy, Inc., under NASA contract NAS5-26555. Support for MAST for non-HST data is provided by the NASA Office of Space Science via grant NAG5-7584 and by other grants and contracts. The galaxy is approximately 22 Mpc (71.7 million light years) distant from the Sun. It occupies an area 3′.0 × 2′.7 in size. It was discovered by John Herschel on September 30, 1834. IC 1459 is a peculiar E3-type giant elliptical galaxy with an apparent magnitude of 10.97, located at a distance of 68.8 million light years from Earth. The galaxy occupies an area 5.2’ by 3.8’ in size and lies on the border between Grus and Piscis Austrinus. It was discovered by Edward Emerson Barnard in 1892. IC 1459 is notable for being the central member of the IC 1459 Group and for having a fast counter-rotating stellar core, shells and ripples. NGC 7418 is a barred spiral galaxy in Grus constellation. It was discovered by John Herschel on August 30, 1834. The galaxy has an apparent magnitude of 10.9. NGC 7421 is another barred spiral galaxy in Grus, also discovered by John Herschel in August 1834. It has an apparent magnitude of 11.7. The Grus Quartet is a group of four interacting galaxies – NGC 7552, NGC 7590, NGC 7599 and NGC 7582 – located northeast of the star Theta Gruis. All the galaxies are members of the IC 1459 Group. The galaxies NGC 7590, NGC 7599 and NGC 7582 occupy an area only 10 arc minutes across and are sometimes known as the Grus Triplet. NGC 7552 is a barred spiral galaxy with a visual magnitude of 10.6. It has an apparent size of 3.4′ by 2.7′. The galaxy was discovered together with NGC 7582 by the Scottish astronomer James Dunlop on July 7, 1826. NGC 7582 is a barred spiral galaxy with an angular size of 5.0’ by 2.1’, located at an approximate distance of 70 million light years. It has an apparent magnitude of 11.37. It is classified as a Seyfert 2 galaxy. NGC 7590 is another barred spiral Seyfert 2 galaxy. It has a visual magnitude of 11.3 and lies at a distance of 75 million light years. James Dunlop discovered it on July 14, 1826, a week after first spotting the other two nearby galaxies. NGC 7599 is a barred spiral galaxy with an angular size of 4.4’ by 1.4’ and a visual magnitude of 11.5. It was discovered by John Herschel on September 2, 1836. 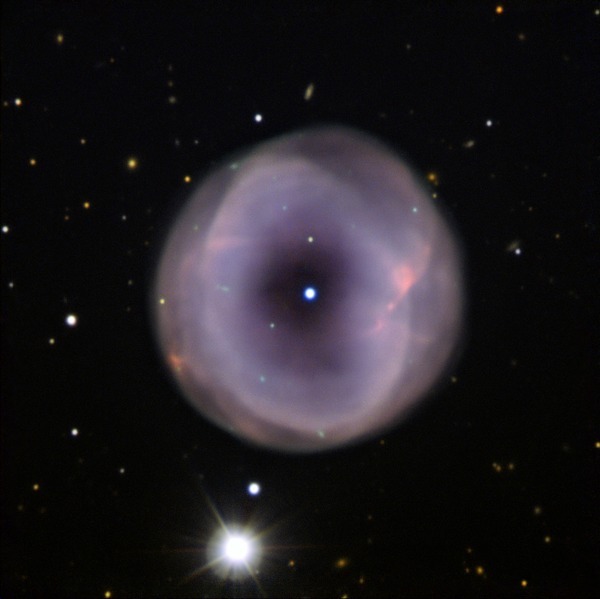 IC 5148 is a planetary nebula that can be seen about a degree west of the star Lambda Gruis. Nicknamed the Spare Tyre Nebula, it is one of the fastest expanding planetary nebulae known, with an expansion rate of 50 km/s. The nebula occupies an area of 2’ by 2’ and has a visual magnitude of 16.5. It lies at an approximate distance of 3,000 light years from Earth. IC 5264 is a spiral galaxy with a visual magnitude of 12, approximately 155.7 million light years (47.7 Mpc) distant from the Sun. It was discovered by the American astronomer Lewis Swift in June 1896. NGC 7462 is a barred spiral galaxy discovered by John Herschel on September 5, 1834. The galaxy has an apparent magnitude of 11.4 and lies at a distance of about 49 million light years from Earth. NGC 7462, based on observations made with the NASA/ESA Hubble Space Telescope, and obtained from the Hubble Legacy Archive, which is a collaboration between the Space Telescope Science Institute (STScI/NASA), the Space Telescope European Coordinating Facility (ST-ECF/ESA) and the Canadian Astronomy Data Centre (CADC/NRC/CSA). IC 5201 is a barred spiral galaxy located at an approximate distance of 42 million light years from the Sun. The galaxy was discovered by Joseph Lunt in 1900. It has a visual magnitude of 10.8. Grus contains many other notable deep sky objects. These include the barred spiral galaxies NGC 7119A, NGC 7091, NGC 7632, NGC 7232, NGC 7232A, NGC 7232B, NGC 7418, NGC 7400, NGC 7496A, NGC 7470, NGC 7412A, NGC 7072A, NGC 7079, NGC 7107, IC 5174, spiral galaxies NGC 7119B, NGC 7658A, NGC 7658B, NGC 7418A, NGC 7213, NGC 7496B, NGC 7070A, NGC 7249, IC 5128, and elliptical galaxies NGC 7404, NGC 7075, NGC 7169, NGC 7097, NGC 7118, NGC 7117, NGC 7144, and NGC 7145.